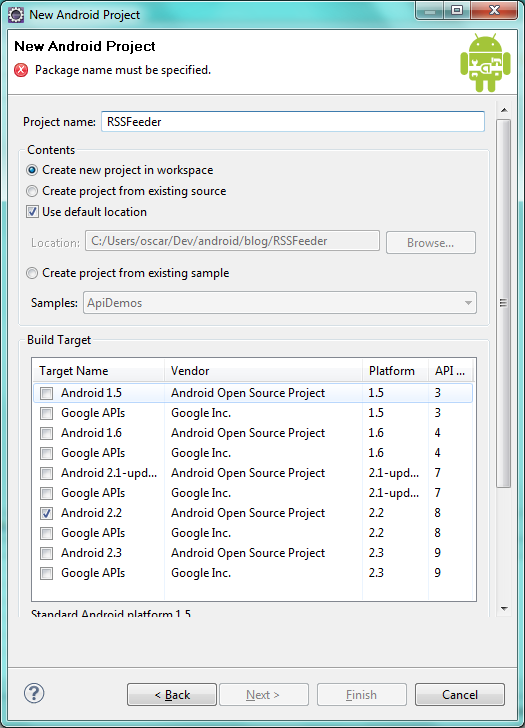 The below document describes how to read RSS feeds in Android. The below example will read a RSS file and the contents will be displayed in a ListView. I won’t cover how to code the ListView component, but the explanation can be found in one of my previous posts. The RSS format is basically a XML file with a defined structure. In Java, there are multiple ways to read a XML document (SAX, DOM, STAX, etc). The below code uses the XmlPullParser class to read the XML; this class is similar to STAX (Android does not come with this API) and provide an easy way to parse xml data. Finally, the below code is based on an article posted by IBM. 1.2) You can put any name to the project, in my case, I called it RSSFeeder. 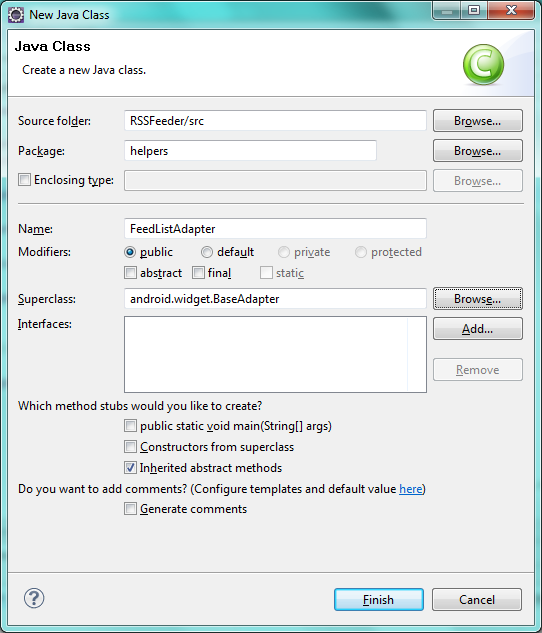 The android version specified is 2.2, but the code should work correctly on later versions. In the “Properties” section, you must provide the application name, package name and the activity name. These fields were filled out as follows: RSSFeeder, com.expertnotfound.rssfeed, RSSMain. If you want to create an Android test project, click on NEXT, otherwise select FINISH. As you can see, this class implements the Comparable interface. It becomes useful if you want to sort your items by title, description or anything else other than date (the RSS feeds already come sorted by date) . 1.5) The next step is the parser class. For this task, we will implement 2 classes; the first one, is an abstract class that will contain the XML tags that we will be reading and the methods that are expected by any RSS parser. The second class, will extend the abstract class and will do all the parsing. The constructor will receive as input the URL for the RSS feed and the getInputStream method will open the HTTP connection and will return the InputStream that will be used by the XmlPullParser object. The parse method will go through all the XML document looking for the tags we need and the content will be stored as a Message object; at the end, a List with all the Messages found will be returned. The advantage of the XmlPullParser class is that we don’t need to search for open/close or nested tags. the start_document, close_document, start_tag, end_tag are already defined as part of the class and we only need to worry about the tags we are looking for. 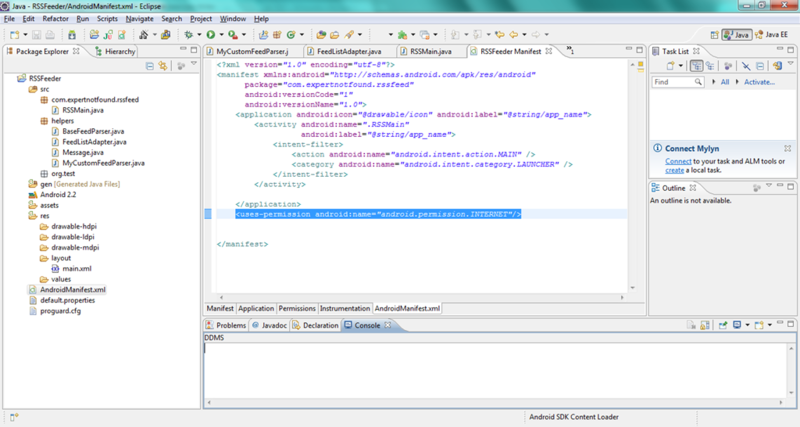 Once any of them is found, its content will be stored in the Message object. This entry was posted on Saturday, March 17th, 2012 at 1:05 am	and posted in Android. You can follow any responses to this entry through the RSS 2.0 feed.